Many people say that slots are amongst the biggest house edge games in a casino....but are they? Slot machine gambling is the scene of myths and various fairy tales concerning the payout rate and the house edge featured. Slots are games which do not really require that players have any sort of a deep understanding of how the game works and skills to exploit it to the maximum. Slots are games for everyone. You can just pop into an online casino, make a deposit and be rolling the reels before you know it, with absolutely no further requirements. Some say all this laxity comes at a cost though, and that supposedly, Slots are among the highest house-edge casino games. Those claims are easy to combat though: most slot machines feature house edges from 2% to 15%. That’s right, some slot machines do indeed pay back 98 cents for the dollar especially if the player knows hot to minimize the house edge. On average, the house edge on slots is around 8%. If you think that’s the worst deal that you can have in a casino, think again. The house edge is 14% on Baccarat (on tie bets at least). The edge is 18% on Casino War, 11% on craps, 33% on Sic Bo, 24% on Big Six and up to 30% on Keno. How do slots look now? The average 8% house edge is rather misleading though. Certainly, there are slot games out there which feature big house edges, but all you really need is to check out the payout percentages displayed on the machines to find a better deal. Just to make it clear: it’s not really the house edge that hurts you, rather, it’s the house drop, but since the house drop increases in a relatively direct proportion with the house edge, looking at the house edge is still pretty relevant. While there are no skills involved in playing slots, playing them properly will result in a much reduced house edge. What can you do to “play properly” though? First of all, take your gambling online. Online casinos can afford to feature smaller house edges than land based ones, because of their smaller operating costs. Just think about it in these terms: the live casino needs room and crew to operate its slot machines. The number of machines it can cram into the available space is also limited. An online casino doesn’t need a crew to supervise its slot machines and there is virtually no limit to the number of slots it can add to its selection. Add all these tiny edges up and you’ll see why an online casino can afford to be much kinder to its players than a live one. The bet-to-win ratios featured by the slot machines are also quite impressive to say the least. If you play max coins, and if there’s a huge progressive jackpot on offer, you can literally turn a few bucks into tens of thousands, maybe even more. The entertainment value of the setup is excellent as well. You can quite literally play for hours for a few measly bucks, squeezing a much bigger bang out of your buck than most of the other casino games allow for. You reckon all those spinning reels and not much else is likely to turn boring soon? Most modern slots feature interesting and vividly animated bonus rounds that will keep you interested for hours on end. Hockey Hero is an exciting sports theme slot from RTG. Get onto the ice rink and skate your way to riches and bonus games. 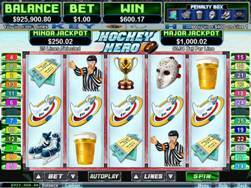 The wild Hockey Hero symbol only appears on reels 2 and 4 and will double all payouts when he is included in a winning payline. If 3 or more penalty boxes appear scattered on the screen - this will activate the power play free game feature where peanut symbols are sent to the Penalty Box at the start of the feature, and after every 3 free games another symbol gets evicted. There is also a win-win feature at the end of the free spins feature which will be activated if all 25 lines are played. If you are going to play roulette online for the 1st time, then read our basics to roulette especially for beginners! 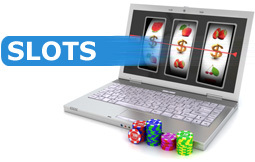 When you are looking for the best online slots to play check out online slots review websites.